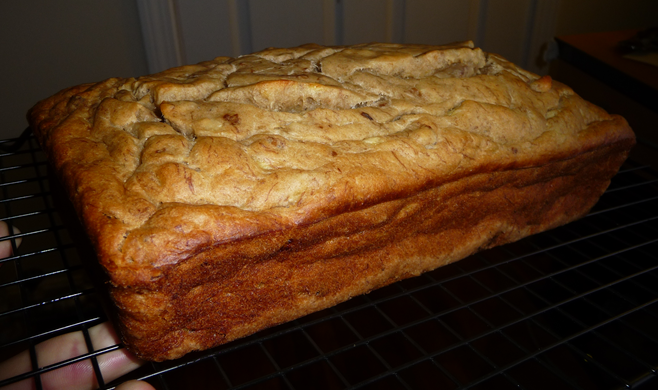 I'm interested in making dairy-free Banana nut bread. What can I use as an alternative to butter? I'm aware that there is soy and coconut milk as alternatives to cow's milk, but I'm not immediately sure that using those will work as a substitute, as cow's milk is to soy milk as (regular) butter is to soy butter (which is not the same concept, as I understand?). Basically I'm wondering what products exist which would provide the chemical properties of butter without being dairy. Butter flavored shortening and a touch of water (because butter has water in it too). The key thing here is that you have a have a solid fat because you're beating air bubbles into the butter during the creaming process. These bubbles are needed for the bread to properly rise during baking. The browning process may be an issue though - shortening has no protein. You're after an umami flavor from the Malliard reaction ... it may be difficult to add that because of the lack of protein. A pinch of MSG maybe, for the umami? Not the answer you're looking for? Browse other questions tagged substitutions bread butter or ask your own question. Baker's Ammonia with yeast—good idea?